Sana felt her phone vibrate. Gakusha had sent Sana a note: HOW WAS UR FAV CUSTOMER? Just then, the door that never opened to the back opened. A stern looking SImMan came out. "Yes, yes sir?" She quickly realized there was no place to put her phone in the bandage dress, so she sat it on the desk. "Has the professor been by today?" "Yes. Left not long ago. But he's not going far." "You know where he's going?" SimMan looked both alarmed and intrigued. "Where?" "The movie theatre in Itaya Point." "Has he mentioned where else he goes?" "Just the university and his home, I guess." "I see. Should he come back today, ask him when he'll be at the university tomorrow. I may call him there." The door closed as quickly as it opened. Sana was feeling a little bored. She texted: G: GOT A CRAZY IDEA. LET'S SEND FAV CUST TO PUB! As she sent it, the door chime alerted her to a customer. She recognized the face. "Ma'am, didn't we meet yesterday?" "We did," replied Akira. "You work here?" "There was an outfit I once saw here...yes." Akira held up what appeared to be denim overalls with lace. "Did you want to accessorize it?" "No, just put a white shirt with it. In fact, are you busy tomorrow?" "Can you come in to this address at sunrise? Seven AM? It'll just be us. You'll be in and out by eight thirty." "Here's the address. Wear this, with a white shirt or blouse. This one. Oh, and keep the change." She was gone as quickly as she came. Sana texted. G! IM A MODEL!! OMG!! Gakusha smiled. He was now dating a model! Gakusha and Sana drove to the pub. She saw a very large man waiting outside a door next to the pub. She smiled sweetly and approached. "Good evening, sir. Is this the pub?" "Next door. This is the Club Royal, for boxers and athletes." Better! "Oh. Could we come, see?" Takeo took the couple inside the club. In the back were weights and a boxing ring. A large bag dangled from the ceiling. "Everything you see here. Thirty a month. I usually only have male clients, just so you know." "Oh, I was looking on behalf of a man." "Him?" The former Bloody King smiled broadly and looked at Gakusha. "He could use it!" Sana pressed on. "We'll pay double for the first month if you do us a favor. A mutual friend will come here tomorrow and pick up these. "She handed the great man the brass knuckles. "We don't use those here." "But do we have a deal?" "If your boyfriend will show me what he's got on the bag, I agree." "Okay, 'Rocky', show us what you've got!" How hard could it be, Gakusha thought. 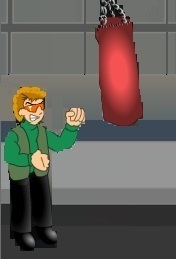 He threw the first left punch of his life at the bag. It's a good thing I'm right handed, he murmured to himself a moment later. "Sixty it is," crowed Takeo. "And we have ice in back." Sana took over driving duties. She made a few turns he hadn't seen before, and arrived at a darkened house.She turned on a light as they came inside. In the kitchen, she unwrapped his hand. It really was not that bad, but she fawned over it just the same. "You know what this hand needs?" He asked. She walked over and looked at the bruised hand. "Probably." Then she took it and and placed it under her shirt, and let his fingers stroke her breast. "But I've got better plans for it." His non-punching hand moved her bra above her breasts as she reached for his belt. She felt the cool metal of the fridge against her back as he lowered her pants to the floor. She knelt in front of him and yanked his pants below his knees. She crawled behind him on all fours. He knelt behind her, clutching her shoulders as he entered her from behind. A few miles away, SimMan looked at his colleagues. "I think Professor Kudo is comfortable coming into the mystic shop. Now what we need him to do, is bring the Saiyan Scouter!" "But how?" A voice asked.